Are you ready for this? Watch the official season three trailer for the Into the Badlands TV show, from AMC. Into the Badlands, season three, premieres on AMC, on Sunday, April 22, 2018 at 10:00pm ET/PT. The network introduced its first trailer for the third season, during a panel at WonderCon Anaheim 2018, over the weekend. An AMC post-apocalyptic, martial arts drama, Into the Badlands stars Daniel Wu, Eleanor Matsuura, Stephen Lang, Sherman Augustus, Babu Ceesay, Orla Brady, Aramis Knight, Emily Beecham, Ally Ioannides, Lorraine Toussaint, Ella-Rae Smith, Lewis Tan, Dean-Charles Chapman, and Nick Frost. The AMC series takes place centuries into the future, in a feudal society called the Badlands. 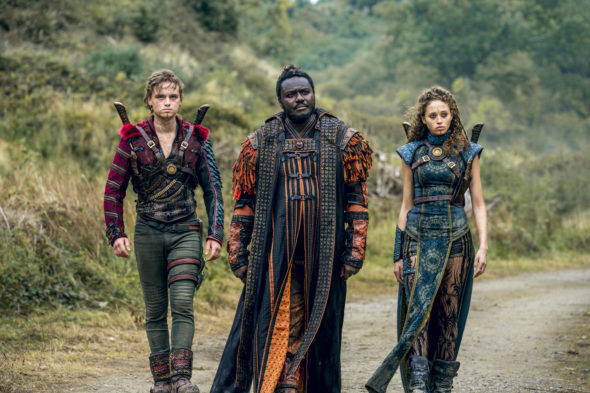 Here’s more on the third season of Into the Badlands from AMC. Season three of “Into the Badlands“ finds Sunny (Daniel Wu of Tomb Raider) living off the grid, doing his best to provide for his infant son, Henry, in the wake of Veil’s death. It is only when Henry contracts a mysterious illness that Sunny must join forces with Bajie (Nick Frost of Shaun of the Dead) and journey back into the Badlands, where The Widow (Emily Beecham of Daphne) and Baron Chau (Eleanor Matsuura of Wonder Woman) are entrenched in a drawn-out war that has destabilized the entire region. No longer supported by Tilda (Ally Ioannides of Parenthood) or Waldo (Stephen Lang of Avatar), The Widow must find new allies in Lydia (Orla Brady of Fringe) and in Nathaniel Moon (Sherman Augustus of Westworld) — the former regent who lost his hand to Sunny and Bajie in Season two. But when a mysterious nomadic leader called Pilgrim (Babou Ceesay of Guerilla [sic]) arrives in the Badlands on a mission to restore Azra and usher in a new era of “peace,” old enemies must band together to defend the Badlands. From AMC Studios, “Into the Badlands” was created by executive producers, showrunners and writers Alfred Gough and Miles Millar (Smallville) and is executive produced by Oscar®-nominated producers Stacey Sher (Django Unchained) and Michael Shamberg (Contagion), along with David Dobkin (The Judge), Stephen Fung (Tai Chi Zero), Michael Taylor (TURN: Washington’s Spies) and Wu. What do you think? How was the trailer? Do you plan to tune in for the third season of the Into the Badlands TV series on AMC?